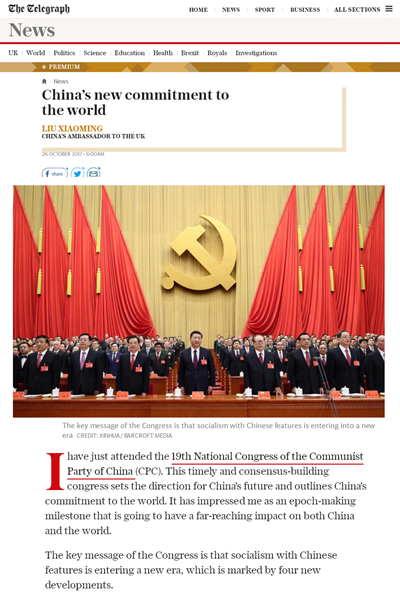 The Daily Telegraph Publishes a Signed Article by Ambassador Liu Xiaoming Entitled " China's New Commitment to the World "
I have just attended the 19th National Congress of the Communist Party of China (CPC). This timely and consensus-building congress sets the direction for China's future and outlines China's commitment to the world. It has impressed me as an epoch-making milestone that is going to have a far-reaching impact on both China and the world. The key message of the Congress is that socialism with Chinese features is entering a new era, which is marked by four new developments. There is, first of all, new development in theory. The Congress has adopted the Xi Jinping Thought on socialism with Chinese characteristics for the new era. This is the latest adaptation of Marxism to Chinese conditions. It is the CPC's understanding of the laws of social progress and it answers the question of how to adhere to and continue building socialism with Chinese features. As in the past, the CPC is determined but not rigid; it is always ready to learn but never copy blindly; and it is committed to blazing its own trail in line with China's national conditions and the trend of the times. Then there is a new priority. This is to address unbalanced and inadequate development in order to meet the people's ever-growing needs for a better life. As a Party believing in putting people first, the CPC has solved the subsistence issue for over one billion people and is leading the nation to achieve moderate prosperity. Now the focus will be on satisfying people's growing needs for greater democracy, rule of law, justice, security and a better environment, and achieving well-rounded development for every individual and social progress in all respects. Thirdly, there is a new timetable and roadmap for China's development in the coming decades. These are the goals of building a moderately prosperous society by the 100th anniversary of the CPC in 2020, realising socialist modernisation by 2035, and building China into a great modern socialist country that is prosperous, strong, democratic, culturally advanced, harmonious and beautiful by the middle of this century when the People's Republic celebrates its 100-year anniversary. Above all, there is a new central leadership. As we say, great cause requires strong and firm guidance. In a massive country like China, development and progress would be impossible without strong leadership. The new CPC central leadership with Xi Jinping at its core is confident and determined in leading the Chinese people into a new era and realising the Chinese dream of national rejuvenation. China has become stronger and wealthier. What will this mean for the world? The 19th Congress has highlighted three new missions of a stronger and wealthier China. The first is to blaze a new path for state-to-state relations. This path differs from the trajectory of traditional powers, because China has been and will always be a staunch force upholding world peace. A stronger and more developed China will never seek hegemony or expansion. Our vision for the world is for everyone to come together and build a shared future for all mankind. To this end, we will hold high the banner of peace, development and win-win cooperation, and promote a new type of state-to-state relations based on mutual respect, fairness and justice, cooperation and mutual benefit. The old logic that "the winner takes it all" or "strength leads to hegemony" has no place in the 21st century where countries should embrace dialogue and partnership and reject confrontation and alliance with one against another. The second mission is to make new endeavours for human progress. China has been and will always be a force for global development because we have the confidence and capability of not only getting things done at home but also bringing along other countries. Around the world, China is forging partnerships, expanding common interests and welcoming other countries aboard the "express train" of China's rapid growth; China advocates an open world economy and promotes trade and investment liberalisation and facilitation; China has launched a new platform for international cooperation and common prosperity with the "Belt and Road" Initiative; China has stepped up assistance to developing countries, the least developed in particular, in order to close the development gap and enable balanced and universal growth. The third mission is to contribute new solutions. With the theory of socialism with Chinese characteristics for a new era, China is contributing to the wealth of existing political systems and governance models by offering its path from development to modernisation. In global governance, China is committed to extensive consultation, joint contribution and shared benefits, and strives to be a force for international order and rules. China respects other countries' independent choices and will never impose its own will onto others. China stands for resolving disputes through dialogue and consultation, and advocates exchanges, mutual learning and co-existence between different civilizations. These are examples of China's wisdom and solutions in response to the common challenges facing mankind. The Chinese nation believes in harmony and sharing prosperity. We believe that happiness has the same definition wherever you are. 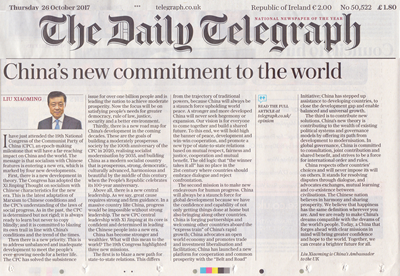 And we are ready to make China's dreams compatible with the dreams of the world's people. Today, a China that forges ahead with clear missions in mind will bring greater confidence and hope to the world. Together, we can create a brighter future for everyone.